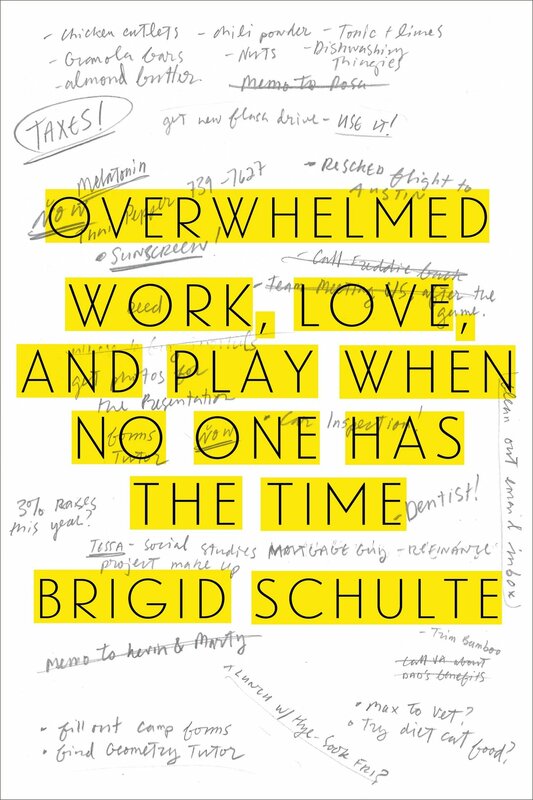 Brigid Schulte is the author of the New York Times bestselling book on time pressure, Overwhelmed: Work, Love & Play when No One Has the Time, which named one of the notable books of the year by the Washington Post and NPR, and won the Virginia Library Association’s literary nonfiction award. I first met Brigid Schulte when she spoke at my daughter’s school, to a bunch of very busy, overwhelmed, Type A parents. Her message about finding the balance between work, love and play really resonated with me (and lots of people I know). She also has been going through some life / career changes that are pretty inspiring. She is no longer with the Washington Post, but now serves as the founding director of The Good Life Initiative at the nonpartisan think tank, New America, and director of the Future of Work-Life program. Her insights below are worth reading – no matter how busy you are! LS: What drove you to write Overwhelmed: Work, Love & Play when No One has the Time? BS: I’d love to say that I had a moment of clarity, that I had reached the end of my rope and decided to figure out why. But to be perfectly honest, I sort of fell into writing this book. I did feel like I was at the end of my rope. I felt harried, stressed-out, every cliché out there – I’d put on 30 pounds of extra weight because I never could seem to find time to exercise, or felt guilty if I did something that didn’t involve my kids. I wasn’t sleeping, chased through my dreams by an unending To Do list that kept me up at night, my mind spinning and waking me up in a searing panic at night. I’d broken out in a wicked case of stress eczema and when I asked my dermatologist why, he’d just tossed some prescription cream at me and said, “My job isn’t to tell you why, it’s to make it stop itching.” I was feeling polluted, guilty and inadequate all the time, at work, as a wife and mother, as a housekeeper, as a human being. I remember distinctly listening to people reminiscing about a great memory, and realizing, I’d been there, and being hit with the thought – “That sounded really fun. I wish I could have enjoyed it while I was living it.” But at the same time, I would think of people who had it so much worse. I mean, I had a job, a roof over my head, plenty of food to eat … obviously … a loving family. I would think – shut up and stop complaining. So – as I got to the end of my rope, I just kept going, clinging to the fraying filaments! The point is – I didn’t think it could change. That this was just the way things were as a working mother, or working parent in the crazy 21st century. It really all started when a time-use researcher told me I had 30 hours of leisure a week. (Great – one more thing that I was doing badly!) And when I told him he was crazy, he challenged me to keep a time diary. He set out to prove me to that I did have 30 hours of leisure. And I angrily wanted to prove him wrong, was secretly terrified that he was right, but more, was really yearning to know if things could be different. If there was a way to live a good life, for both men and women, for people who wanted to find meaningful work, time for love and human connection and even have time for joy, laughter, fun and play. Everything I’d read made it sound like you had to drop out, move to a farm and jump in puddles or flee to India and meditate in a cave for months. When I took up the time diary challenge, it really became a quest to see if there was a way to transform our ordinary lives, right here, right now. LS: What did you learn while writing this book that caused you to make changes in your own life? BS: What did I learn? Man! Where do I start? During the process of reporting, researching and writing the book, I felt like everyday there was a new revelation – all about the most fundamental things about life that I thought I knew. When it comes to WORK – I’d always been a workaholic. I completely bought the notion that the harder and longer you work, not only do you show how much more committed and serious you are as a worker, but the better you work. I was blown away by the growing body of serious research that shows that that’s not only NOT true, but that working all-out, full-on with no breaks actually makes the work WORSE. You deplete your energy. And by not giving your brain time to rest, restore, wander, wonder and daydream, you’re actually blocking the neurological process that fosters creativity, innovation and even productivity. That was a big surprise. As was looking at international comparisons of hourly productivity. The U.S. works among the longest hours of any advanced economy, we take very little vacation – we’re the only advanced economy that has no national policy guaranteeing paid vacation – we don’t use all the vacation days we have, all with the thought that the harder we work, the better we’re working – and yet, when it comes to hourly productivity, we’re matched or beaten by countries like Norway, Denmark and even France, where people have months of paid parental leave, several guaranteed holidays and four to six weeks of guaranteed paid vacation every year that everybody takes. So I try to work differently. It’s still a work in progress. But I try to set my days up very deliberately now. I keep in mind what my priorities are – both for doing my job, and for what I need to grow and have meaning in life. I try to set my To Do list from those priorities. And rather than expect to do everything from here to eternity by the end of the day, I choose ONE thing to do each day – and sometimes that’s a work project, sometimes it’s having family dinner when I feel like we’ve been scattered, and sometimes it’s making sure I go for a run to clear my head. I completely embrace the science and logic of taking breaks, and work in discreet “chunks” of time, with time to walk around the block, or completely change the channel in between. I would say I’ve not only been MORE productive, but I’ve done better and more creative work as a result. As far as LOVE – I was chagrined, when I had the time to really look at it, that my own marriage had slipped into traditional gender roles, even though we’d promised to be equal partners and both my husband and I firmly believe in an egalitarian world, for us, and for our kids. I began to see how so much of my own feeling of breathless time pressure had a lot to do with how I’d assumed near total responsibility for the home front, not only doing the physical labor, but also the heavy mental labor of logistics control – the planning, organizing, finding summer camps, being on the listserves, finding child care, setting up carpools, worrying about whether there was enough food in the cupboards – I hadn’t realized how much keeping track of all that stuff really cluttered my head. But I also hadn’t realized how much of that I’d brought on myself, because that’s what I automatically assumed I SHOULD do to be a good mother. When I began thinking, and when my husband and I began having the discussions we should have had 20 years before, I realized how we’d both been imprisoned by our automatic assumptions, particularly about what it meant to be a good mother. I’d been raised in a very traditional family, and even though I bristled against traditional roles and wanted something different, I didn’t have role models to follow and hadn’t realized how much of those traditional gender roles I’d internalized. And how much I’d unconsciously been influenced by being a “good girl” and living up to societal expectations. Driven by a deep desire to understand what was “normal” and “natural” – since so much of our political discourse and our policies assume that breadwinner-homemaker families are best – I sought out Sarah Blaffer Hrdy, the world’s foremost researcher on motherhood, and spent a fascinating day with her at her walnut farm in northern California, understanding the science and history of motherhood. Through her research, I came to see how we’re at a point where we’ve never expected mothers to do more and be more than at any other point in human history, and we expect her to do it on her own. It’s punishing, unproductive and not good for anyone. Humans evolved as cooperative breeders. We’ve always helped each other raise our young – mothers and fathers, family and neighbors – “alloparents” she calls them. Because of her research, I began looking more deeply into the scientific literature and finding that there really isn’t the “maternal instinct” that is so deeply a part of our conventional wisdom. That both men and wired are biologically and neurologically wired for nurture. But what women have always had early on that men haven’t, especially since the Industrial Revolution, is time. Women have had the time to develop competence and confidence about caring for infants. And when we give men that time early on – it changes everything for the better. Studies in the countries that have policies that support men and women taking parental leave have found that men and women begin sharing work and home lives more fairly – in the U.S., women are still doing twice the housework and child care, even when they work full time. Research is finding, not surprisingly, that when couples feel the division of labor is fair, children develop close bonds with both parents and couples feel happier and more bonded. My book recounts the journey my husband and I began to navigate our way back to our ideal of being true partners. And I have to say, though we’re still a work in progress, it has made an enormous difference in our lives. We really share physical and mental tasks. We take turns taking the kids to their doctor and dentist appointments – and making the appointments. My husband is no longer “helping out” or the “fun parent.” I love seeing how close he is to the kids – how they call him to check in, or ask permission, not just me, as they used to. And I love how its transformed our own relationship. I don’t feel resentful and arch all the time, as I used to. It’s like we’ve found our way back to each other again. And when it comes to PLAY, my life has really changed completely. I used to think play, free time, was for childhood. I had to be productive at all times. Even before kids, I remember having the day off from work once, and cleaning under the oven hood in our rented apartment. I mean – really??!! I used to live in what I call the If/Then mentality: IF I finish every last thing on my To Do list, THEN I can relax, have fun, read a book, enjoy my life. But then all I’d do was add more stuff to the list. I lived in a permanent state of IF. I never got to THEN. It was such a revelation to find that there was an actual field of feminist leisure research (who knew!?) – and that one of the first studies was called: “Women’s Leisure, What Leisure?” That throughout human history, women have never had a history or culture of leisure. The “good” woman was always busy bustling about. Women’s leisure was “invisible” and productive – the quilting bees, the canning parties, the communal gardens, even today’s book clubs. An international study found that women around the globe tend to feel they don’t deserve to have free time or leisure time, they have to earn it. And the only way to earn it, is to get to the end of that never-ending To Do list. It’s as if women are all living in the IF state. And yet, the more I read about leisure time, the more I realized that it’s in that leisure, or free time, when you lose yourself, when time becomes timeless, in a state of flow, that’s not only what psychologists call peak human experience, it’s also been when civilization has been created – art, literature, music, scientific discoveries. And women’s time has been too fragmented or interrupted – and people have felt they haven’t deserved it – to enter this state of flow. I began to realize that time is a feminist issue. That the reason there aren’t as many great women painters displayed in the museums, that there aren’t more women writers on the book shelves is not that women haven’t had the ideas or the talent, they haven’t had the time. And now that everyone’s time is more fragmented with the encroaching and never-ending demands of an overwork culture, and the pings and distractions of technology, finding a way to protect the opportunity to sink into flow – which requires uninterrupted blocks of concentrated time – is critical for everyone. I’m a passionate evangelist for equal opportunity flow! So – here again – I’m a work in progress. I do make time to play. And I recognize that sometimes that’s going to require making choices – and choices that may not feel very comfortable. But I’m practicing. There are times when I’ve chosen to go kayaking, or read a book BEFORE folding a mountain of laundry. I’m trying to break loose of the IF/THEN mentality – and choose joy and refreshing my soul first. I’m trying to train myself – the dusting can wait. LS: You recently left your job as a reporter for The Washington Post and are now the Founding Director of The Good Life Initiative at the New America Foundation. Very exciting! Tell us about your new role. What are some cool projects you are working on now? BS: I loved my time at The Washington Post, and am excited about this new adventure at New America. I’m still what I’ve always been: a writer, reporter, researcher and journalist, and will continue that core mission – to continue to dig deeply into the two questions that motivated my journey of the book: why are things the way they are, and how can they be better for all of us? In addition, we have a number of exciting projects and events that we’re working on, to continue to elevate the conversation about how we think of work-life issues, to explore the Future of Work, how it’s changing, the innovations that draw on the best research and science to show how to shape work in way that fosters autonomy, mastery and purpose so people and companies can thrive, and how our policies can continue to evolve to support and nurture the Future of Families – all families. We are non-partisan and all about Big Ideas and transformative solutions at New America, which is what I love about it – I had a fellowship here while I was writing the book. So I’m looking forward to convening events and Round Tables, and getting people who might never talk to one another to sit around a table and really listen to one another, to find common ground and move us out of the stagnant place of thinking, policy and action where we’ve been stuck since the early 1970s. I understand change can be daunting. And that we humans learn through stories and change when we change the narrative, and see role models showing us how the seemingly impossible is actually possible. So we will be looking at what works, highlighting the Bright Spots out there, and showing, practically, how people and companies on the forefront of change get from here to there, the costs and benefits, and why it matters. Stay tuned, or, better yet, join our strategic network, support our work, and become part of the push for a saner, healthier, sustainable, egalitarian world! LS: One of the big concepts we’ve discussed in the past is the importance of having a supportive work culture. What are some examples of organizations that have what you consider “healthy” cultures? BS: I don’t think you have to go much farther than the incredibly rigorous and persuasive controlled studies that NIH and CDC funded with some of the best work-life scholars in the country looking at work cultures and health. It’s so clear that when managers are trained to understand and manage “whole” people who work and have lives outside of work, when work is organized in flexible ways focused on mission and performance, not hours and face time, work gets better, people are more productive, have more energy, are healthier physically and mentally, take better care of their health, have more time to spend with their families and children, and show greater job satisfaction, positive mood, loyalty and intention to stay. I mean – it’s all common sense. But we finally have the data that shows that if we want our companies and organizations at their best, our workers have to be at their best. And that means recognizing they’re not machines, they’re not the 1950s ideal worker with no caregiving responsibilities, they are whole and authentic human beings, and if you organize work around that, everyone benefits. LS: Five years from now, what will we all be talking about when it comes to our work-life? BS: In five years, I hope we continue moving out of an old, calcified thinking that work-life automatically conjures up busy moms, the mommy track and making grudging concessions for “women’s initiatives” to keep women in the workplace. That kind of thinking has held all of us back. I would hope, and I do believe we’re moving in that direction, that we have a full understanding that what we’re really talking about is The Good Life for everyone – that means meaningful work, not overwork, work without end, that means flexible work, not only of time, manner and place that promotes autonomy for the professional class, but schedule control, an end to on-demand scheduling for low-wage workers. I would hope we continue to move beyond outdated notions of gender roles, to truly embrace an egalitarian future where humans get to be just that – human. Where we embrace a variety of family structures – which, frankly, we already have – and find ways to support and nurture them to give all children the best chance to grow and thrive. I would sincerely hope that we will have moved beyond the current punitive and limited thinking about policy to understanding that supporting working families is not only an economic imperative, but about renewing the American Dream of a good and fulfilling life for future generations, not just the 1 percent. Where careers and success are no longer narrow, steep ladders, but fluid, flexible, creative. I would hope we would embrace the real aim of work-life work: as Ellen Galinsky of the Families and Work Institute said recently and brilliantly: a world with true freedom of choice without penalty. And I would hope that we will have begun to believe the emerging research about the importance of deliberate rest, renewal, leisure – that that kind of time not only makes us more productive and creative, but it’s what we need as humans to have joyful and meaningful lives. LS: For those who are interested in reading more about Brigid Schulte, where can they go? Sign up for her occasional newsletter, Toward Time Serenity, on the art and science of The Good Life: brigidschulte.com. She lives in Alexandria, Virginia, with her husband, Tom Bowman, a reporter for National Public Radio, and their two children. She has spoken all over the world about the causes and consequences of our unsustainable, always-on culture, and how to make time for The Good Life by rethinking how we work, by re-imagining gender roles for a fairer division of labor and opportunity at work and home and, instead of seeking status in busyness, by recapturing the value of leisure. She was an award-winning journalist for The Washington Post and The Washington Post Magazine and part of the team that won the 2008 Pulitzer Prize. She now serves as the founding director of The Good Life Initiative at the nonpartisan think tank, New America, and director of the Future of Work-Life program, both of which seek to elevate the conversation, explore transformative solutions and highlight how work-life issues are key to excellence, productivity and innovation, as well as a full, authentic and meaningful life. She grew up in Portland, Oregon and spent her summers with family in Wyoming, where she did not feel overwhelmed. I want to buy a dozen copies of this book and give it to all the working women I know. Schulte does a good job of synthesizing studies and ideas about time and expectations, raising questions that we as a society should be asking and are not. Her writing is very smooth and easy to read with a combination of interviews, study references and individual stories. I can't recommend this book enough.